WACO, Texas (Jan. 18, 2017) — For more than three decades a legal dispute raged between Oklahoma and Arkansas over acceptable phosphorus levels in the scenic waterways along the Illinois River. The issue eventually reached the U.S. Supreme Court in 1992. 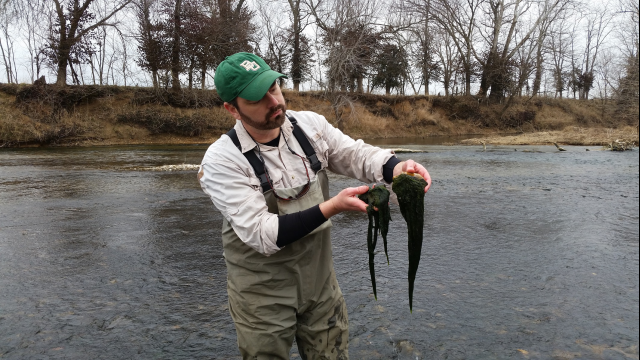 A three-year study conducted by Ryan S. King, Ph.D., professor of biology in Baylor’s College of Arts & Sciences, recently helped settle the long-standing dispute by estimating phosphorus levels in the Illinois River and nearby rivers and streams that could result in undesirable water quality and aesthetics. The Arkansas-Oklahoma Scenic Rivers Joint Study Committee, which was tasked with developing a phosphorus water-quality standard for Oklahoma’s scenic rivers, awarded King a $600,000 grant in 2014 to conduct the study. “What’s so unique about this study is the way two states came together. This whole process of working with the committee to refine the way we were collecting and analyzing data to meet their needs and to help them make those decisions is unique and might be a framework for others dealing with these types of environmental problems,” King said. “This project illustrates that there is hope for compromise. There is hope for working together to develop a strong, defensible solution to a problem,” he said. The dispute arose as Oklahoma’s scenic rivers experienced elevated phosphorus concentrations from municipal wastewater and land application of poultry litter and fertilizers, which led to an increase in the growth of algae in the rivers. However, phosphorus concentrations have declined over the last decade but were believed to remain above desirable levels by Oklahoma. Although the high algae growth probably doesn’t pose a health threat to humans, King said it can compromise enjoyment of water activities, such as swimming and canoeing, and can have a significant effect on aquatic life. For the project, King assembled a team of three technicians and several Baylor graduate students, along with Jeffrey Back, Ph.D., lab instrument specialist in Baylor’s Center for Reservoir and Aquatic Systems Research (CRASR), who collected water samples from 35 locations along the Illinois River, its tributaries and other scenic rivers. Their goal was to quantify algae growth and how it related to the phosphorus levels found in the water. King credits the team for the successful completion of the study. “This study wouldn’t have been possible without the buy-in of several graduate students, technicians and colleagues who were a part of this research team. While I was the one directing the study and actively involved in it, every single person who was involved in this study on Baylor’s side was critical to its execution,” King said. King began collecting data in the summer of 2014 and every two months until data collection was complete in mid-2016. The College of Arts and Sciences is Baylor University’s oldest and largest academic division, consisting of 26 academic departments and 13 academic centers and institutes. The more than 5,000 courses taught in the College span topics from art and theatre to religion, philosophy, sociology and the natural sciences. Faculty conduct research around the world, and research on the undergraduate and graduate level is prevalent throughout all disciplines. Visit www.baylor.edu/artsandsciences.